Funny you should mention the “ringing in your ears.” Gripped by that “ringing”, I flee in one way or another. So many times it’s someone with an agenda. No thanks. Interesting about the ringing in your ear! Uh huh. She really was quite lovely and rather charming and there was a sense of a let-down in me, sigh. Good for you, MJ. Your intuition is right on, my friend. I have been where you were and responded similarly. 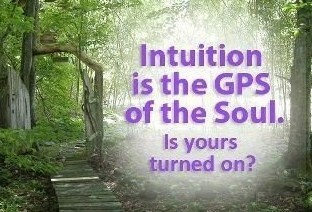 Love the notion of intuition being the GPS of the soul. So true! I loved that GPS-reference as well. I had a feeling you experience this as well; glad you listen! Oooooo. I have that book, and it’s great. One day when my husband and I were leaving a movie theater (at a mall), we were just getting into my car when a woman approached the passenger’s side (where my husband was sitting). In a nanosecond I had a warning flash across my mind: a small poster that someone had taped to the movie theater door, warning people to stay away from a particular woman- with a pencil sketch of the woman- flashed in front of me. Then all of a sudden, as my husband was trying to get his window down to see what this woman wanted (thank goodness they’re electric windows, and I hadn’t started the car yet), all I could get out of my mouth was, “No, no, no, no, no!” She saw me and decided to walk away. As she turned, the word predator flashed through my mind. Since that time, I have taken a few classes to learn how to connect to my intuition, and to trust what I get. Thanks for a great article! What an experience for you and your husband … did he have a lot of questions for you? Did it make sense to him? I would love to take a class to explore this further, although I don’t think I need it per se .. just find it interesting. My husband didn’t really say much. I told him what I experienced, and he pretty much grunted. He didn’t dismiss it, though. Whenever someone starts talking about their (or my) colon I act like I hear someone paging me and say “that call was for me…I gotta go.” I run into this situation frequently as I work in retail for a company that stresses “helpful and friendly” so I’ll run into a kook once in a while and either get away from them OR if I’m feeling tired or ornery…just disagree with them and call it a day. Our company dietitian was in last week spouting the “benefits of eating pumpkin rinds.” I choose to walk away from that, after stating that the only way our customers would injest said pumpkin rind is if it had been soaked thoroughly with vodka. (this didn’t faze her the slightist…she’s in her own world where no ones opinion matters but hers). Good post…I gotta tend to my colon…it’s acting up ya know? Yes, that word has a way of sounding alarm bells all on its own. Pumpkin rinds? Just IMAGINE what that would do to your system — eek! You are a very intuitive person, MJ. And I suppose I am as well. But knowing that, means we can listen to our guts or ears or whatever it is that says ‘flee’. Take the card and shred it. You don’t need anything she is selling. You’re right – the card didn’t make it into my pocket! There is still a part of me who wants to be nice and accepting of everyone. Then there’s a part that says, “um … no, not this one. Too much for you.” And that’s who I listened to here. Oh, yes, I’ve encountered this. No ringing in my ears though. I usually just smile and be polite, and as Georgette commented, I flee – physically, if possible, or mentally! Either way, you get the sign and you heed it – well done! Oh that is the worst. I don’t get an audible alarm, but that moment is when the “fake plastered polite” smile appears on my face and further engagement from my end comes to a halt. So sad. .. I have one of those “deer in the headlights” smiles that I pull out for such times, too! Glad I came over here to read this as well.